The power of bodybuilding has far-reaching ramifications. Nimrod is proof. He found Bodybuilding.com and constructed a plan to put his flabby self in the rear view mirror! I was one of the skinniest guys in school. I started working out at the gym in September 2011 with a purpose—to bulk up. I fell in love with the bodybuilding lifestyle. The diet, the workout program, the motivation, and everything in between are addicting. Because I had no idea what I was doing, I did a messy dirty bulk and gained a lot of weight (40 pounds in six months), which was mostly fat. When your mom says you're fat, it's time to change. On the March 1, 2012, I decided to change my lifestyle and eat healthy for a change. I had a pile of motivation to start. 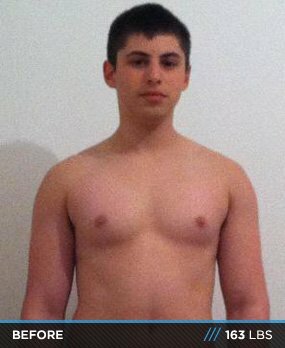 Two of my best friends, who had a history of weight lifting and dieting, helped me change my crappy lifestyle and motivated me the entire time. I listened to every word they said (still do) and adapted it to my lifestyle. If you set your mind to it, it will happen. I never really had a chance to experiment with supplements mostly because it is so expensive in Israel. Changing the eating habits I picked up over the last 18 years was the hardest part. All the pizzas, burgers, and other junk food held me down. One of the main obstacles was school; it's not easy being in high school and eating healthy meals every 2-3 hours, especially with classes and exams. I use a three-day split, but work out five days a week. I use heavy weight, low reps, and short rest periods (about 30-60 seconds). I do abs every other day and cardio 2-3 times a week for 15-20 minutes if I have enough motivation after the intense workouts. The diet challenged me most. It's hard to get rid of old habits and eat completely different from what you're used to. The mental state is so hard. Having almost no carbs affects you physically and mentally. I plan to compete in a couple years, but there's a lot of work to be done before I can. I want to become a trainer and work in a gym to better myself and others. It all starts with trial and error. Try different dieting and training programs until you find a regimen your body responds best to. Set goals and don't exaggerate them. It's important to be realistic or you'll disappoint yourself constantly. Tell yourself: "I want to look like that guy" or "I want to lose x pounds/body fat." Never quit. No matter what, don't tell yourself that you can't do it anymore. Don't take breaks for weeks or days. If you do, you won't want to get back into the routine. Never cheat yourself. It only hurts you in the end. Bodybuilding.com helps me so much. I learned a lot from the articles and the online training programs. I mostly watched Steve Cook and currently follow the Big Man On Campus trainer, but there are so many excellent trainers like Kris Gethin, Mike O'Hearn, and Jim Stoppani. I like using the tools like protein and carbs calculators. The post-workout shake calculator is absolute magic. BodySpace is awesome also. It lets me see the results in front of my eyes aside from the mirror.